Make this flavorful, beefy sauce for pasta and you’ll never go back to the canned version! 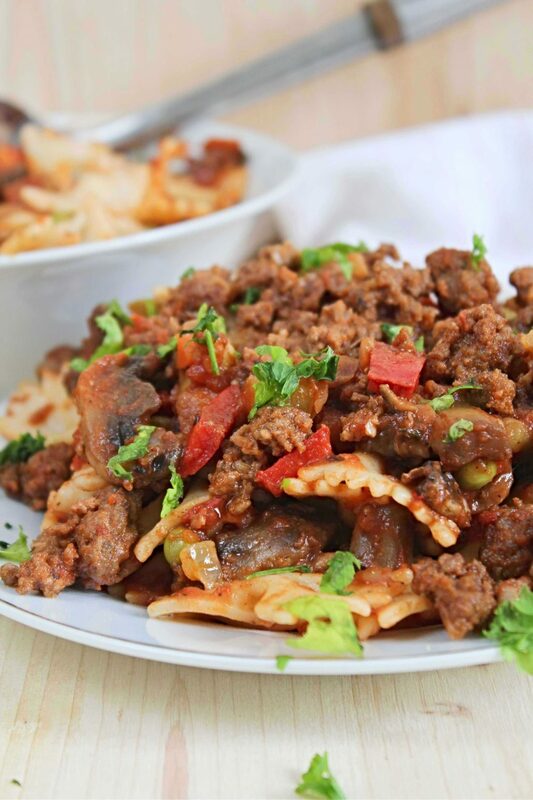 This beef pasta recipe is full of amazing flavors and comes together in just minutes! My little munchkin is insanely picky and I’m always looking for ideas to make food more enticing and attractive to her without spending hours in the kitchen. 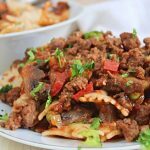 This beef pasta recipe uses a meaty sauce that is so delicious and flavorful, even picky eaters like mine will be hooked. 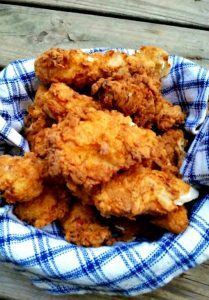 In fact, Ellie keeps asking for this recipe on a weekly basis, she’s in love with the amazing flavors in this recipe! 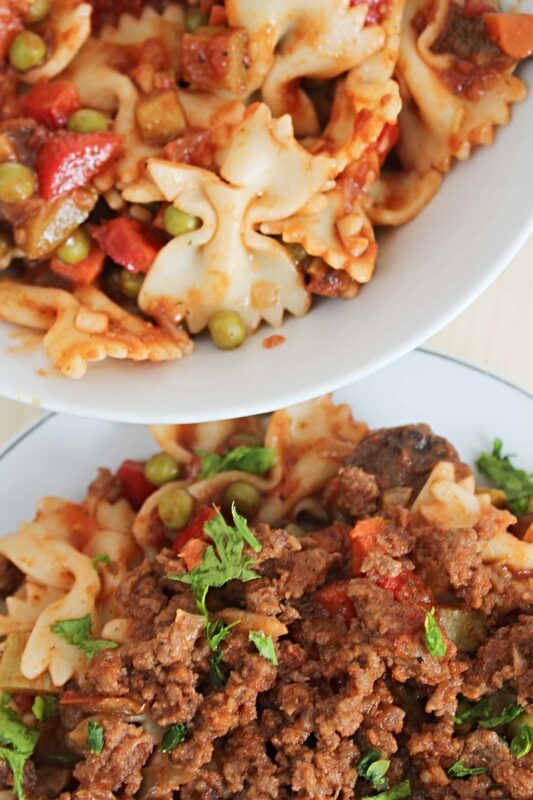 My beef pasta is simple and super easy to make, using real ingredients you most likely have in the pantry and it won’t take a lot of time to make, it’s ready to serve in 30 minutes or less. 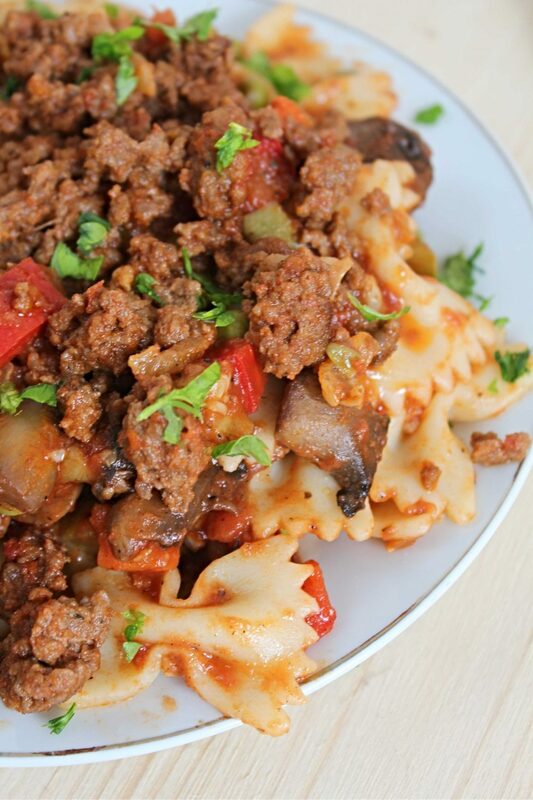 This ground beef and pasta makes a great dinner idea for busy families! Heat the oil in a large skillet and add onion. Saute until slightly soft, about 1 minute, then add ground beef. Stir often, breaking the meat into small bits and cook until the meat is almost browned. Add the garlic and herbs and cook until garlic is fragrant, about 2 minutes. 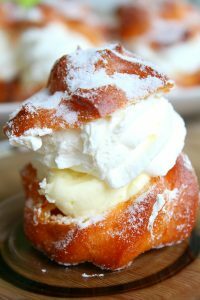 Set aside on a covered plate. Use the same skillet (no need to wash) and heat the 2 tablespoons of olive oil. Add bell pepper and zucchini and cook until slightly roasted, about 3 minutes. Add mushrooms and cook until mushrooms are soft and the water has evaporated. Time to add the frozen veggie and cook until just a little soft. Mix in garlic and the herbs and spices and cook until garlic is fragrant, about 2 minutes. In a large bowl, mix cooked beef and vegetables then fold in the cooked pasta, mixing gently to avoid breaking the pasta. Serve immediately with grated provolone or Parmesan and chopped fresh parsley. Keep leftovers stored in the fridge, in an airtight container, for up to 3 days. Thanks to the amazing ground beef pasta sauce in this recipe we have added a new tradition: beef pasta night, almost every week. 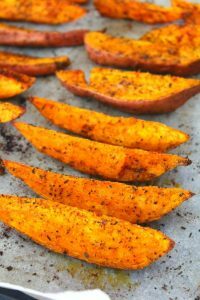 This is definitely one of those recipes you’ll end up making over and over again, it’s just too yummy easy and quick, your go to recipe when you’re busy and tired but don’t want to sacrifice on flavor and good food. There’s nothing like homemade food and this is particularly true when it comes to pasta recipes. A good homemade sauce makes the whole difference and the sauce in this minced beef pasta is definitely one of the best you’ll make! 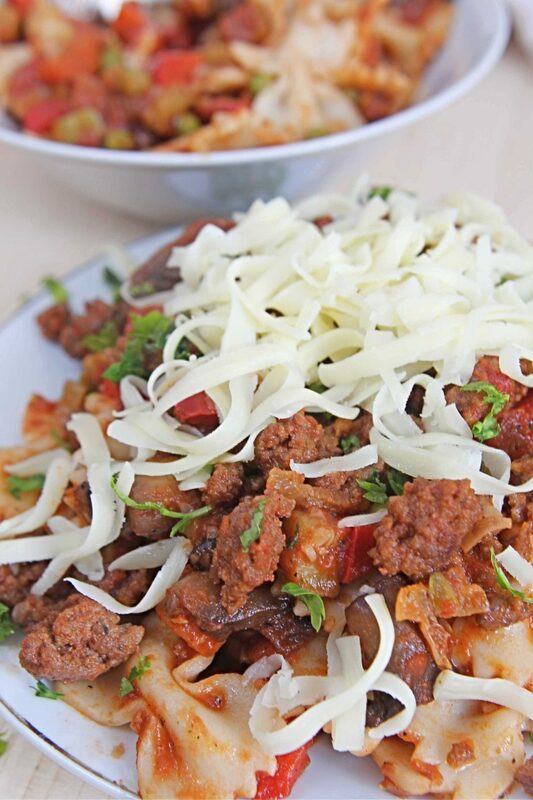 We enjoy this delicious beef pasta recipe with lots and lots of vegetables (another “sneaky” way to incorporate more veggies in our diet) and a touch of grated provolone cheese, just before serving the dish. We love adding our favorite veggie like red bell peppers, mushrooms, carrots, peas and summer squash or zucchini. 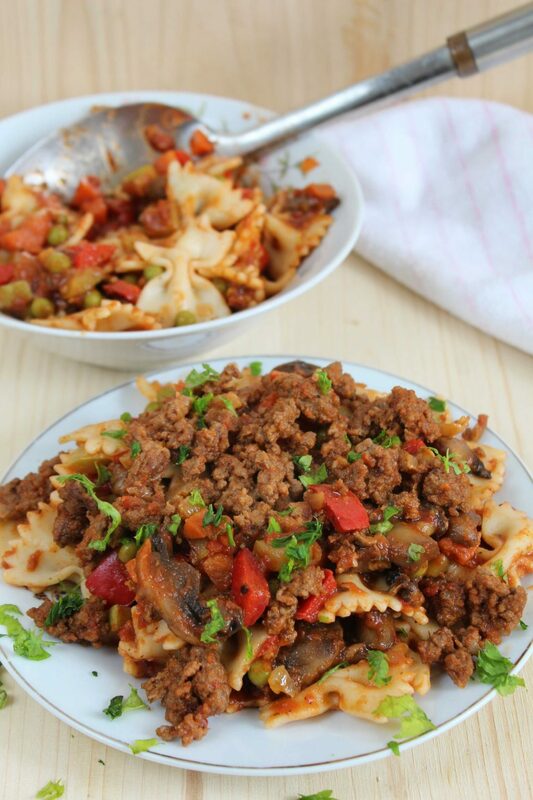 I found this combo works best for us and together with the ground beef make this beef pasta a nutritious, filling and satisfying dish!